I recently shared the creation of LoveBot, a new character of mine. Then I shared a day-in-the-life story of LoveBot, and I’ve received a lot of good responses from that. LoveBot powers up, unplugs, and leaves his apartment building. When he makes it to the street, he looks around. The coast is clear. He opens his body compartment, pulls out his teddy bear, and gives it a hug.Suddenly, he is bumped from behind by another robot walking down the street. LoveBot drops the teddy bear and the other robot notices. LoveBot is embarrassed and picks up the teddy bear while the other robot is confused. LoveBot quickly puts the teddy bear back into his body compartment and continues on his route to work—down to the subway train, watching the robot eyes as they glow in the dark tunnels, and then onto the robot-only street. As LoveBot approaches the factory where he works, he sees a grassy hill in the distance. LoveBot blinks and his eyes zoom in on the hill. It looks like fun. But LoveBot looks at the door of the factory and knows that he should go to work. Robots all around him are entering the factory. LoveBot looks to the hill and then at the door of the factory and then back to the hill. LoveBot is at a full sprint when he reaches the end of the sidewalk and begins running on the grass that leads up to the hill. His heavy body leaves footprints in the grass. When he reaches the top of the hill, he can look beyond and see trees and flowers. Lovebot opens his body compartment and pulls out the teddy bear. He holds out the teddy bear to see the trees and flowers, and then pulls the teddy bear close and squeezes it. He then grabs the teddy bear by the hands and starts to spin in a circle. He spins faster and faster until the pair is a swirling blur. Then something shoots out from the blur and LoveBot stops spinning. LoveBot is still holding the arms of the teddy bear, but the rest of it is gone. LoveBot looks around from the top of the hill. He looks in all directions and finally finds the teddy bear at the bottom of the hill, lying under a tree. LoveBot runs over to it, pulls out a needle and some thread from his compartment, and begins to repair the bear. When LoveBot is almost done with the repair, he sees a small boy running up the hill he had just been on. When the boy reaches the top, he trips on one of LoveBot’s footprints and skids his knee on the ground. His parents run up to him and his mother comforts him. His father looks at the place where the boy tripped and then looks over at LoveBot. The two lock eyes. The man is angry; LoveBot is scared. The man pulls out his cell phone and makes a call. LoveBot stops sewing and swiftly puts the teddy bear into his compartment. He runs back to the sidewalk and hurriedly into the factory. He looks at a clock that shows the time in binary and looks panicked. He pushes into the time clock, rushes to his station, and the other robots in his assembly line are looking at him impatiently. He looks sorry and starts pressing buttons quickly. At the end of his shift, LoveBot punches out and his boss—a large, angry robot—is standing next to the time puncher. The boss lets out a beep boop and then steam begins to shoot out of his ears. LoveBot looks defeated. LoveBot looks very sad on his commute home. When he makes it to his apartment building, he stops and looks around. The coast is clear. He pulls out the teddy bear, but it is missing an arm. He checks his compartment, but it isn’t there. The arm must’ve fallen off when he rushed to put the teddy bear in the compartment. LoveBot goes into the alley between his building and the next to look through a dumpster. After some searching, his head pops out of the dumpster and he holds up a can of Standard Robot Oil. He then climbs out of the dumpster, but instead of getting out smoothly, he falls. When he stands up, he pulls out the teddy bear and keeps his back turned. It’s clear he’s working on something. Finally, when LoveBot turns around, the teddy bear now has a Standard Robot Oil can for an arm. He pulls the teddy bear close for a hug, and the oil can makes a small clang against LoveBot’s body. It surprised LoveBot and he holds the teddy bear out. He taps the arm, and it makes a clanging noise. LoveBot is happy and pulls the teddy bear in for another hug. So, that’s LoveBot’s second story. I think I’ve got some ideas for LoveBot’s next story. And possibly the three after that. You can change his battery. You can change his motherboard. But you can’t change his heart. LoveBot powers up in a dark hallway. The red heart on his chest slowly lights up from the bottom to the top. When the heart is full, his eyes turn on like the powering on of an old television. Once he is on, his eyes grow dim like he is tired. He lowers one of his arms and removes a plug from an outlet near the ground and it recedes into the back of LoveBot’s left foot. LoveBot looks around and sees rows of other robots up and down the hallway, all plugged into the wall. He moves forward slowly and walks down the long hall to a doorway. He opens the door and sunlight overtakes him. LoveBot steps outside. LoveBot walks down a street of large, dark, windowless buildings. They all have signs flashing saying “₡30 a Month” and “Outlets starting at ₡25.” He hears something coming from near one of the signs and walks over to it. Behind the sign is a birds nest and some baby birds are tweeting. He watches them sweetly and his heart starts to glow. Suddenly a mother bird swoops in and it throws LoveBot off balance. He falls onto the ground. The bird flies to the nest with worms in its mouth and gives a glare at LoveBot. He gets up and continues on. LoveBot comes upon a stairwell leading into the ground and walks down. He joins a large group of other robots waiting for a train. When the train pulls up, it’s just a grated floor with bars for frames. LoveBot walks onto the grated floor and grabs one of the bars. The train moves forward. LoveBot can see the lights from the eyes of other robots illuminating the dark subway tunnel. When LoveBot reaches his destination, he walks up a tunnel and onto a urban/suburban area. He walks down a sidewalk designated for robots. He can look to the other side of the street and see humans using a different sidewalk. LoveBot walks past a fenced playground where children are playing. He stops to watch them. The heart in his chest starts to glow bright. Another robot on the sidewalk bumps into him and it breaks his concentration. He looks to see who did it, but the sidewalk is too busy. Right as he’s about to turn back, he is hit in the head with a rock. He turns and sees the kids on the playground standing in a group with folded arms, staring at him. He turns and continues walking. LoveBot arrives at a large black building with a smokestack pushing out steam. He goes in and walks over to a time clock. He opens the door to his body, pulls out a car, and punches it in the time clock. He puts the card back and walks over to an assembly line. A furry, empty pouch appears in front of him on the assembly line. He presses a button and stuffing comes out from above the pouch and fills up what is now clearly a body of a teddy bear (minus the head). He presses another button and the next body appears. He hits the first button and it gets filled. He hits the next button and is goes down the line. Zooming out, you can see the entire factory of robots hitting buttons along a twisty assembly line. At the end, teddy bears end up being piled into a cardboard box. The box is then moved to a spot where it is closed and taped. The box is then put on a truck that drives to a toy store. The box comes off the truck, a person unpacks the box, and they put the teddy bears on a shelf. A mom and daughter walk up to the shelf and the girl pulls the teddy bear off the shelf and gives it a big hug. LoveBot clocks out of work and begins walking home as the sun is setting. He’s hit in the body with a rock when he’s passing the playground. A small group of kids is picking up more rocks and throwing them, so he has to run a bit to avoid them. When he can finally begin walking again, he looks at a human family walking down the opposite sidewalk. The little girl in the family is holding a teddy bear in one of her arms. They looks so happy to be with each other. LoveBot gets on the subway train and takes it home. When he is walking down the road of apartment buildings, he looks behind the sign to see how the baby birds are doing. The nest is no longer there. As LoveBot is coming up on his building, a glimmer of light hits his eyes. He turns and looks down a narrow alley between two buildings. Something is shining a light at him from down the alley. He turns sideways and walks slowly so he can fit in the alley. He isn’t as careful as he had hoped, and he scratches a few of the LEDs that make up the heart on his chest. Finally, he comes upon a small teddy bear with one eye—the eye that was catching some light and attracted him into the alley. He reaches into his body and pulls out a needle, some thread, and a machine nut. He sews the machine nut where the other eye of the teddy bear should be. He holds it up to inspect his work. The heart on his chest glows a little brighter. He pulls the teddy bear close to his body and the heart of his chest is so bright that it floods the alley with red light. LoveBot leaves the alley, but he doesn’t seem to be carrying the teddy bear. He walks into his building and down the hallway that leads to his outlet. He lowers his arm to plug himself into the wall. The light of his eyes dims and turns off, but the red glow from his heart is still bright and it pulses with light. Looking through the door to the robots body, you can see the teddy bear is inside. So, that’s LoveBot’s first story. His physical design is still in version 0.3. I’m working on bringing him up to 0.5 by the time I’m able to find an illustrator willing to take on LoveBot’s story. This is the story of how I went from doing normal things in a normal part of my day to creating a character, a story, and a new writing project. Last Friday, I was alphabetizing a list for work, and I decided to write it out by hand instead of typing it. While I was putting pen to paper, a quote from an episode of The Office came to mind from a scene where Michael pretends to be a robot. Watch the clip below. The world is in chaos and those with power are making absolute decisions. Dissent and revolution are in the air. 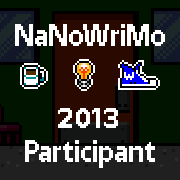 November is almost here, and I’ve already told almost everyone I know about my participation in NaNoWriMo. I’ve also shared how important it is for me that I meet the 50,000 word goal, because I will be taking care of a six-month-old next year and may not have the time to participate. Just like last year, I plan on blogging as I write my novel. I’ve found that to be a huge help with developing my characters and scenes. So if you’re sick of reading about NaNoWriMo, I’ll see you in December. On a slightly different—but slightly similar—topic, I’ve been running a writing prompt blog on the side for the last year or so. It started as an attempt to see what all I could automate with IFTTT, so I set up a WordPress, Blogger, and Tumblr accounts to update with content from an RSS of a writing prompt subreddit. It worked fairly well, and I was putting no effort in. The next phase has been cutting off the RSS feed and writing the content on my own. With that increased control over what the content is and when it goes out, I’ve seen followership increase a little. I’m going to run special NaNoWriMo prompts over the month of November, and hopefully that will help. It’s October, and that means that it’s time to plan for National Novel Writing Month (AKA NaNoWriMo). The good news is that I’ve got my idea nailed down. The bad news…well, so far, there isn’t bad news. This year’s novel is going to be familiar, because it’s going to be based off of last year’s novel. As in it’s going to be the exact same novel, except I’m planning on winning with it this year instead of only reaching 8,000 words. To keep me motivated to write throughout November, I’m going to make a timeline with detailed notes for plot points. I’ve done this before and it’s been very helpful. I’ll be sure to share photos when I’ve got everything laid out. One-line: It’s like Occupy Wall Street meets The Walking Dead (minus zombies) meets The Book of Eli. Short description: The apocalypse has started. The world is ending. But would you know it if you lived it? Tate McLeod and his friends survived the natural disasters, but they soon find themselves in the middle of a war over Chicago. Will the join the side that wishes to maintain the old ways, or will they choose to start society with new rules? I was trying to get some writing done last night, but I couldn’t get started. Then I had a thought that stopped my ability to focus on anything at all. Am I living my life in a way that I would want to write about myself? Am I interesting? I mean, I’ve met some great people and experienced some extraordinary parts of life. But would I write about my own life? And I guess this could be any writer’s/artist’s dilemma. Look at J.J. Abrams. How can that guy’s life be more interesting than LOST or Fringe or Super 8? It can’t. So maybe I don’t need to worry about whether or not I’m living an interesting life. I don’t have to live an interesting life to be a writer. Then again, maybe that would help me to be a better writer.